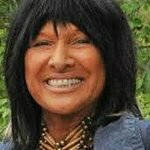 Buffy Sainte-Marie was born on the Piapot Cree First nation Reserve in Saskatchewan, Canada. She has been a social activist throughout her adult life, particularly through her music. She is also a long-time educator of indigenous peoples of the Americas, as well as educating non-indigenous people about First Nations and Native Americans. Google trends for "Buffy Sainte-Marie"
We don't have any videos related to Buffy Sainte-Marie.